Hi, I'd like to show you this page I found on Northeast Factory Direct's website. This item contains a removable tray for simple and protective jewelry storage. Felt lining in the tray keeps your jewelry in place as you open and close the drawer, preventing necklaces from getting tangled and providing a surface that won’t get scratched by various jewels and stones. The tray can also be removed for easier access to your treasured pieces. One reason solid wood is praised for its ability to last for generations is that is can be resanded or refinished if it starts to show scratches and wear. Furniture with thin wood veneers cannot be sanded or finished without damaging and exposing the substrate of wood solids underneath. While furniture with thin wood or plastic veneers is definitely cheaper short-term, the step down in quality will end up costing more in the long run when your furniture needs to be replaced every few years. This piece of furniture isn't the easiest to move from one place to another, but if you intend to stay in one home for a long time, this furniture is definitely heavier and hardier than the rest. Drawers feature full extension metal guides for smooth, reliable drawer function. Metal guides allow you to open and close drawers with ease, sturdy enough for heavy or frequent use in your home. The glides contain a special mechanism for whisper-quiet movement, allowing for a gradual, soft close with even the lightest touch. These smoothly operating glides with soft close ensure drawers don’t slam, providing for longer-lasting furniture and quieter bedroom cleanup. Drawers are constructed with dovetail joinery, ensuring long-lasting strength and storage. Made up of interlocking wedge-shaped elements called pins and tails, the joint connects drawer fronts, sides, and backs, designed to withstand the daily pulling forces you apply when you open a drawer, for problem-free use. 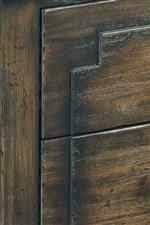 A time-tested joint that predates written history, dovetail drawers are a mark of quality furniture construction. You've finally settled down in your dream home, ready for whatever new challenges life has in store for you. Whether you are raising a family for the first time or pursuing a new stage in life as empty nesters, nothing is a bigger relief than having a reliable home with reliable furniture. When you have dependable, durable furniture that you love, you're saving money and spending more time pursuing the things you love. 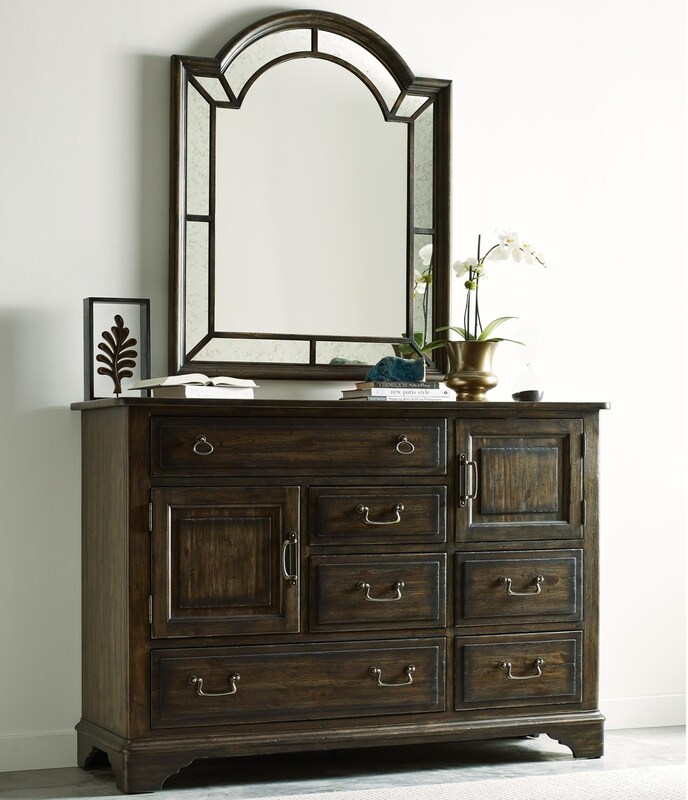 This solid wood bureau and mirror are loveable pieces like that. 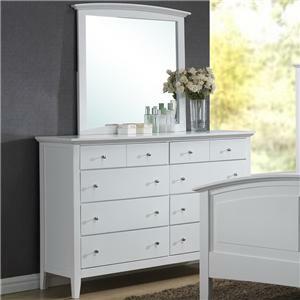 It's made from solid acacia wood with versatile storage for bedroom and media. Six drawers and two cabinets with adjustable shelves provide a place to tuck away clothes, jewelry, and accessories or to store your media players that you pair with your TV. The Wildfire Vintage Bureau with Palladian Mirror Set by Kincaid Furniture at Northeast Factory Direct in the Cleveland, Eastlake, Westlake, Mentor, Medina, Macedonia, Ohio area. Product availability may vary. Contact us for the most current availability on this product. Storage Two Clothing Drawers and Four Accessory Drawers. Second Drawer from Top Includes Jewelry Tray. 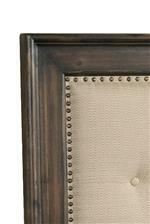 Two Doors Each Enclose One Adjustable Shelf. One Door Cabinet Has Cord Exits for Media Storage. Drawer / Shelf Construction Dovetail drawer construction utilizes the best dovetail for each application. English dovetails on the drawer front and back create a tight fit and add exceptional holding power. Description: Top Solid wood tops with no veneer. Fully floating tops, end panels, bed panels, etc. are incorporated into every product from this collection to allow for normal expansion and contraction of the solid wood components as the humidity changes in your home. Case Construction Case construction features mortise and tenon joinery, a time-proven method of assembling two parts at a 90 degree angle. We also pre-drill and screw tight the parting rails (the structural wood rails that create the drawer opening) these rails stay flush even after the furniture is jostled in its move to a new home or room location. Warranty Kincaid provides a limited one-year warranty to the original purchaser of first-quality Kincaid wood furniture from an authorized dealer that the furniture is free from defects in material and workmanship as noted. 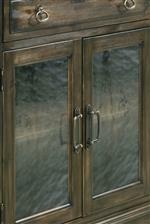 Color and finish variations are natural in wood and are not covered by this warranty. This warranty applies under conditions of normal household use but does not apply to fading (furniture should not be placed in direct sunlight) or defects that result from negligence, soiling, improper cleaning, misuse, abnormal use, accident, or commercial use. Starting with a spark of interest and growing into a cozy blaze that will warm your home for generations, the Wildfire collection is today's answer to heirloom home furniture. It's crafted from solid Acacia wood for the most durable and trustworthy storage pieces, beds, tables, and chairs. But what separates it from the heirloom furniture of your grandmother's generation? Beveled drawer fronts with burnished edges create pleasing dimension while the subtle wire brushing and burnishing add a touch of rustic charm. This distressed and Vintage look, coupled with subtle details like antiqued metal nailheads and seeded glass doors, makes for furniture that can easily be the centerpiece of today's trending room designs like industrial or sophisticated rustic. Wildfire has the quality and style you crave along with handy modern features you can't live without. 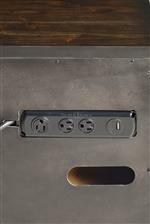 Select pieces include built-in power strips for your lamps and devices and nightstands include built-in nightlights. From the first glance at the elegant shapes and Charred Ember wood finish to the day you pass it onto your own children, the Wildfire solid wood collection will have a special place in your heart. The Wildfire collection is a great option if you are looking for Transitional Traditional furniture in the Cleveland, Eastlake, Westlake, Mentor, Medina, Macedonia, Ohio area. Browse other items in the Wildfire collection from Northeast Factory Direct in the Cleveland, Eastlake, Westlake, Mentor, Medina, Macedonia, Ohio area.